Out on the terrace overlooking the Cowell College courtyard, I watched a spectacle unfold around me during our very special 50th anniversary edition of Alumni Weekend. Hundreds of alumni from across the decades reconnected with each other and the campus, laughing, sharing memories, and feeling grateful for the years they spent here. Our biggest Alumni Weekend yet made me more proud than ever to be the chancellor of UC Santa Cruz. The celebrations of our 50th year have been a smashing success so far, with more to come this fall. 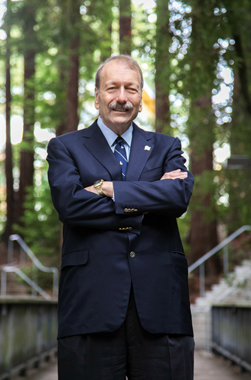 It's gratifying to see the UC Santa Cruz community recognize this anniversary and the strengths and accomplishments of our first half-century. What will we do in our next five decades? Considering its relative youth and modest size, this campus has made outsized contributions. We are consistently ranked one of the best young universities in the world, and our pathbreaking research has tsunami-sized effects that upend disciplines. We will build on this foundation during the next 50 years, making our mark in fields we can't even dream of today. After all, what did our founders know in 1965 about sequencing the human genome, one of our signature achievements? UC Santa Cruz's leadership in bioinformatics opened the door to research and scientific breakthroughs that are transforming the medical field and ushering in the era of precision medicine. This is how we will decode cancer. It's how we will tailor treatment to individual patients. Our breakthroughs in astronomy will yield stunning insights into our understanding of the universe, and our discoveries about the deep oceans and the coastal environment will prompt policy changes to protect these precious resources. Our commitment to social justice will help us find answers to persistent questions of inequality, from feeding a growing population to providing access to education. New forms of creative expression will sustain and challenge us, while scholarship in the humanities will enrich and transform our relationships with ourselves and one another. We will grow our 100,000- strong alumni community, enhance the educational experience for a more diverse group of students than ever, and much more. At the juncture of our first 50 years and the next, I am filled with optimism and eager to usher in the next wave of achievement.